Our Parallel Solar approach handles voltage management at the module level, using a DC-to-DC converter (the vBoost) to boost each module's output. So the array has a high-voltage bus that will never exceed its set voltage as it feeds the central inverter. This allows you to connect the modules in parallel rather than series. 1. Can you give us a brief technical description of what you mean by Parallel Solar? Until recently, virtually every solar array has been wired in series, with modules daisy-chained in strings to sum their voltages. 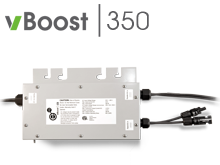 This brings the bus voltage to an appropriate level for the central inverter, typically 300 to 400 volts. While U.S. code allows bus voltages of up to 600V, in practice, you have to be careful – modules typically have an open-circuit voltage (Voc) overhead of about 30 percent, and output voltages vary with temperature and other factors. To make certain that the bus never goes over 600 volts, series-string architecture requires you to leave headroom. So designers face tight constraints on how many modules they can put on a string, and also have to concern themselves with panel mismatch – if one panel is shaded or dirty or otherwise underperforming, it drags the rest of the string down. Our Parallel Solar approach handles voltage management at the module level, using a DC-to-DC converter (the vBoost) to boost each module’s output. So the array has a high-voltage bus that will never exceed its set voltage as it feeds the central inverter. This allows you to connect the modules in parallel rather than series. This means you can put a lot of modules on a single cable run – more than 100 crystalline panels, compared to 14 or so in a series-string array, and up to 400 thin-film panels, compared to just four or five in series-string. Higher voltages also let you get more out of your copper plant, and you eliminate the need for “home run” cabling going back to the end of each string, as well as most of the combiner boxes needed in large series arrays. From an operational perspective, the vBoost provides module-level MPPT, which ensures that each panel contributes as much power as possible, regardless of what’s going on with its neighbors, plus panel-level monitoring and diagnostics. 2. The PV balance of systems sector has been very active over the last couple of years, with many companies pursuing different strategies for cost and efficiency improvements. Why is Parallel Solar a better bet than some of the other options? Is there a size or type of installation where Parallel Solar is most effective? One of the first things people notice is that Parallel Solar cuts out a ton of up-front costs – primarily cabling, combiner boxes, and the on-site labor needed for wiring. Less obvious, but still very significant, is the way Parallel Solar simplifies the array design process. Designers today spend a ton of time worrying about string size and panel mismatch; with Parallel Solar those worries disappear – the designers can focus on integration, aesthetics, and making the array the best power producer it can be. From an operational perspective, in addition to distributed MPPT, Parallel Solar provides a high level of visibility into the daily workings of each panel in an array. This makes it much easier to spot issues and troubleshoot problems, and helps track ROI. There’s a very good economic case to be made for Parallel Solar on almost any size of array, but the benefits become more apparent when you get beyond residential scale and into the small commercial sector and above. 3. You claim that Parallel Solar technology pays for itself pretty much right out of the box with up-front cost savings – how does that work? We mentioned the parts and labor that are saved at installation; we’ve modeled this for a hypothetical 1-megawatt array, and found that you can eliminate over $400,000 worth of direct costs. This more than offsets the cost of the vBoost modules needed for the array, and also creates definite savings on the design side. Once you realize that the cost for Parallel Solar using the vBoost product is basically the same as the cost for a series-string array, then the other benefits come for free. If you consider things like increased harvest, more-efficient operations and maintenance, and more visibility into the operation over the lifetime of an array, our models suggest that the Parallel Solar approach reduces the LCOE on that megawatt array from $0.245/kW (for a series-string architecture) to as low as $0.139/kWh. 4. How does your approach to MPPT differ from other options that are out there? The big advantage to our approach is that it’s operating at the panel level, using the capabilities built into the vBoost; this is far more effective than inverter-level solutions. In general this is the same benefit shared by all of the distributed electronics companies, both DC-to-DC and micro inverters. 5. We’ve heard eIQ Energy people talking about solar array discount rates – how does that sort of thing relate to electronics? The thing to keep in mind is that solar energy installations are still pretty new and unproven, at least compared to traditional power plants. There’s just not as much data out there about how well they age. So the financial community, faced with uncertainty, assigns a higher level of risk to investments in solar, which is reflected in higher discount rates. Because every vBoost module is constantly collecting panel-level data and feeding it to our monitoring system, an array wired with Parallel Solar generates a very detailed track record of its performance over time. We've discussed this with the financial community, and we’re hearing that this type of documentation can and will make a difference in terms of assessing and proving plant value. When a plant can prove its worth, it carries less uncertainty and thus gets a lower discount rate. This is going to be an increasingly important factor in years to come, as a lot of plants will come onto the resale market. 6. It seems pretty certain that fire codes will soon require arc-fault protection for solar arrays. How do you see this affecting eIQ Energy’s business, and the solar sector as a whole? We’re enthusiastic supporters of the arc-fault code requirements. The solar industry is asking people to put electrical generating equipment on the roofs of their houses and businesses and schools, and while our record to date is very good, we need to make sure that safety questions are a non-issue. Getting out ahead of the curve is a good move for all of us, and for our customers. Our engineers anticipated this development when we were developing the vBoost, and our technology inherently has the ability to detect arc faults using its on-board electronics and communication capabilities. At this point, we’re just waiting for the regulatory community to provide definitive information about what the arc fault remedial procedures should be, and we’ll then incorporate them into our product roadmap. All of the detection hardware is already present in our system. 7. What’s been your biggest challenge in your first full year on the market? Have there been any big surprises? For any startup selling products that will have at least a 25-year working lifetime, there is, rightly, a challenge in telling your story and proving your viability. What we’ve found exceedingly valuable is the conversations we’ve had with the whole solar value chain, and confirming that different peoples’ needs are all addressed by Parallel Solar. We’ve talked to module makers, installers, financiers, inverter companies, VCs; many times the same people show up in different areas wearing different hats. But they all seem to get the idea pretty quickly, which is very encouraging. 8. Where do you go from here? Are there new products or offerings in the near future? From a business standpoint, we need to concentrate on making sure our first wave of customers are very successful – we don’t want to jump into new markets until we have a happy and enthusiastic customer base. That said, there are great opportunities for us. Things like higher voltage models that allow us to draw on what we've learned in the 600-volt environment and start to look towards utility-scale and overseas markets. Mr. Lamb brings a unique combination of technical, management and legal experience to his role at eIQ Energy. His background includes seven years as a principal at Cornerstone Venture Partners, where he oversaw funding efforts for international renewable energy initiatives and helped companies create and manage strategic partnerships. He was a co-founder of Digital 5 where he served as VP of Sales and Alliances. He has over 8 years of experience in the energy management field and has held VP level alliance-building positions at companies in the global telecom and multimedia technology sectors. He holds a B.S. degree in electrical engineering from Villanova University, and a J.D. degree from Rutgers University School of Law.